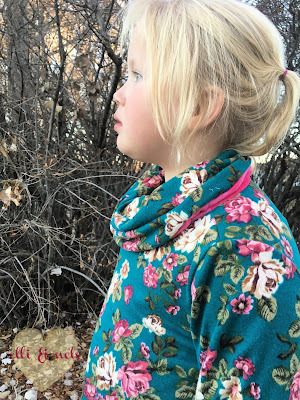 Today I'm sharing a couple of favorites (an old favorite and a new favorite!) from Phat Quarters Patterns. 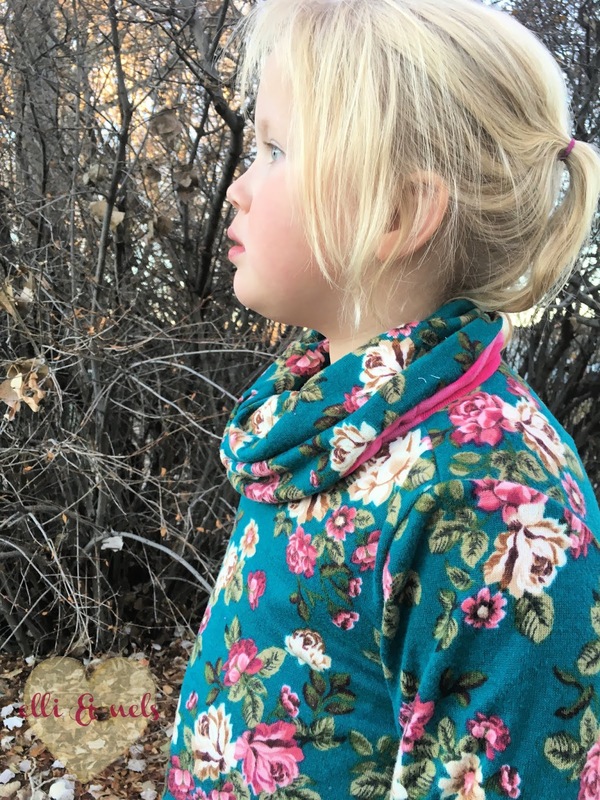 I first made the Rosemary Cowl Sweater not long after it was first released, and though my oldest wore it for a good 6 months, I never managed to get decent pictures of it! So many outfits I never take photos of, so sad! 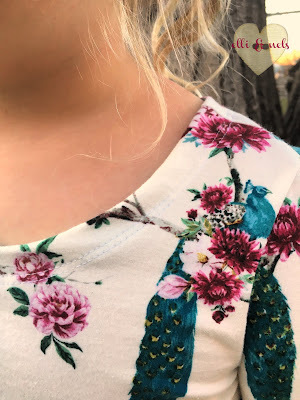 I am more than happy to have these coordinating tops to show off Gemia's beautiful designs today, and to have some photographs for the future! 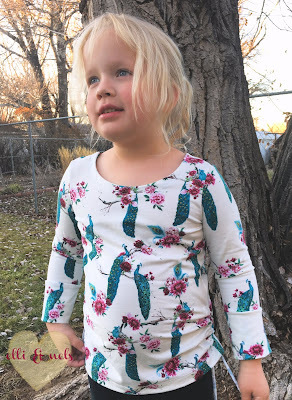 I opted to place drawstrings on the bodice, but there's also an option to put them on the sleeves, which would be really useful for long sleeves and kids who never seem to know if they want their sleeves up or down! I know my oldest will be a fan of those. For Sam's, I added cuffs, and I love the wearability of this top. It's covering enough to keep her warm in chilly weather, but she doesn't have to worry about sleeves being pushed up to keep them clean while at school. 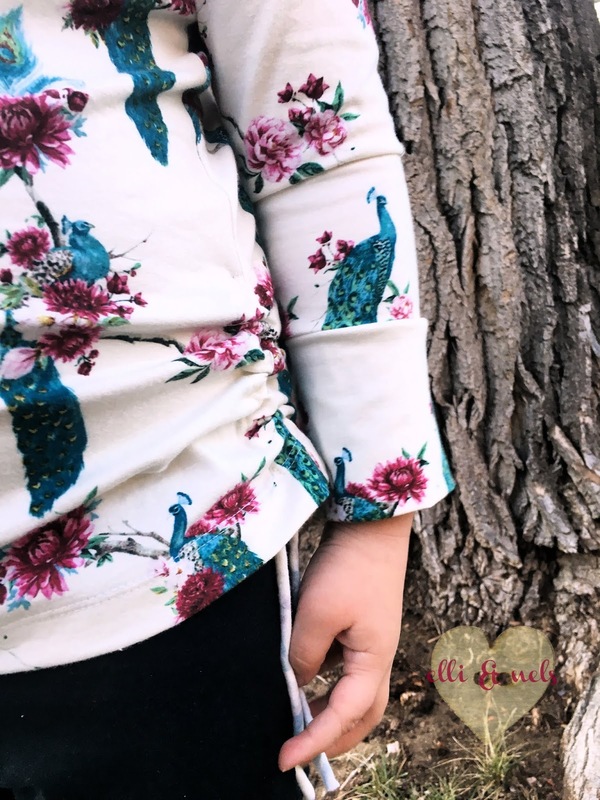 The neckline facing and this gorgeous peacock print fabric are dressy enough feeling for church, but it's a sturdy cotton spandex perfect for play as well. 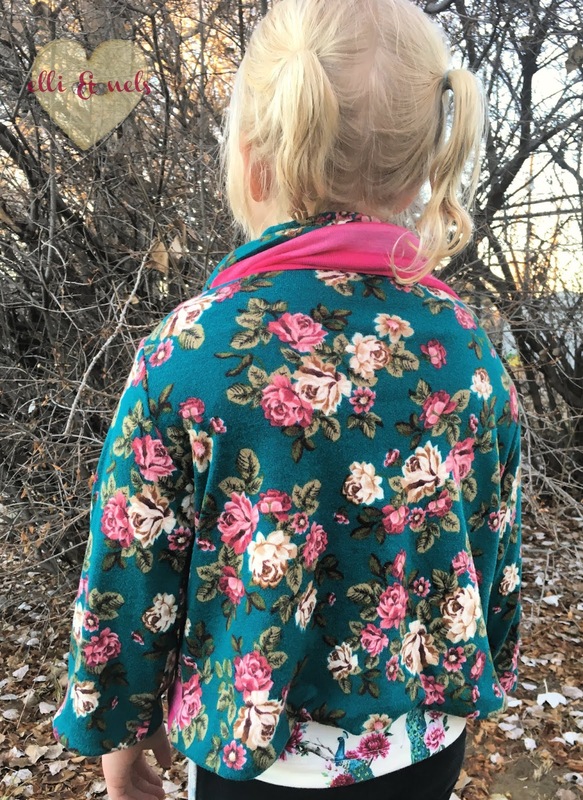 For Rosemary's part, all those clean finishes are the best thing about this pattern. Or maybe it's the fact that because of them, it's fully reversible. I bought two coordinating hacci sweater knits, and immediately could see them as Rosemary. 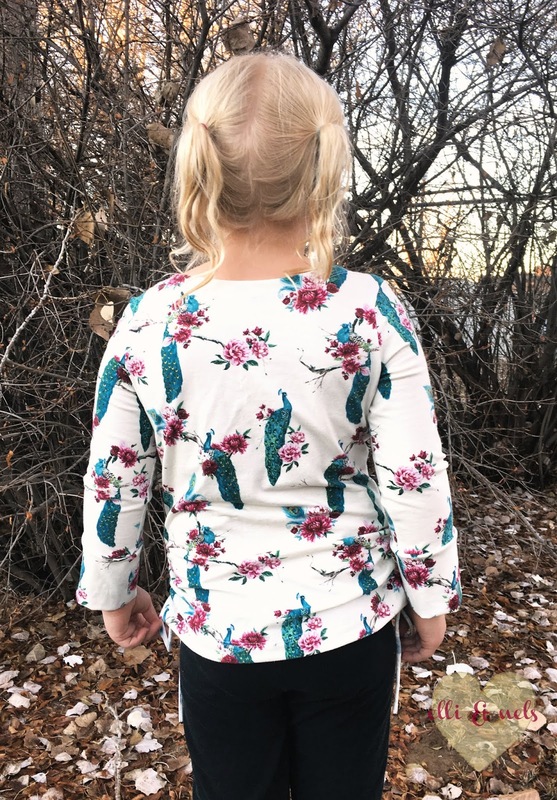 Bonus, they coordinate with the peacock print! 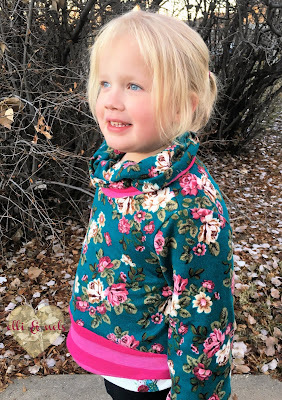 Rosemary has three cowl options (split, button, and simple) - I chose the simple option to let the floral print speak for itself. The sleeves are finished with a neat clean finish, and the cowl as well - I closed my turn hole there with invisible thread and a ladder stitch, so you'd never know it was there! This is the full length sweater with a contrast panel, so I could show off the coordinate as well. The best thing about all of this, of course, is that Sam loves them. She already told me she's wearing them to school tomorrow, and it's always gratifying to make things that my kids will wear again and again! If you want to grab these for yourself (or any of the other great Phat Quarters patterns - see my Alderwood Pullover in this previous post), I hear there might be a Black Friday sale coming!! Join the Facebook group for updates, and of course to share your own PQ creations! I love it! I am so glad both you and your little cutie love it as well! Thank you!!! Thank you! Definitely loved over here <3 so much sweetness!